Innovative, groundbreaking technologies in the mattress industry have had a great impact on the design and manufacturing of today’s sleep products. This has resulted in a large number of different types of mattresses that can be broadly categorized as innerspring, foam or latex, and hybrid mattresses that are combinations of various technologies and materials. With so many different options available, it may be hard to pick the one that will be perfect for you. Each mattress type differs in size, firmness, and other features, and each has its unique characteristics which you should be aware of before you make your next big purchase. Today we’ll be comparing two well-known mattress brands Helix and Tempur Pedic and present you with their basic features and unique characteristics that may help you make your final decision. The Helix mattress varies in terms of the amount of sinkage and motion transfer, depending on the construction of each side and weight of the sleepers. The Helix mattress is priced at $900 for a Queen, which is a good price for customization and the quality materials and construction used in this mattress. Tempur-Pedic, unlike other mattress companies, don’t share a lot of information about their technology. They consider it proprietary information, so there are not many details about the materials they use for the construction of their mattresses, density of the layers, etc. PureCool+ Phase Change Top Layer: This is their new comfort layer that includes exclusive technology designed to wick heat away from the body and provide a cooling layer. All memory foam, no gel materials or anything, and not a lot of public information on exactly what the Breeze consists of. TEMPUR-CM+ Layer: This is their support layer, made of the advanced TEMPUR material which allows maximum airflow and works with the top layer to dissipate heat for all-night cooling comfort and provide overall sleep support. The Foundation Layer: This Layer is made of the Ventilated TEMPUR-APR material which is known to be one of the most pressure relieving materials ever and now it also comes with an ultra breathable design. It serves as the core foundation of this mattress and provides overall support and base for the mattress. The cover of the Tempur Pedic Cloud Luxe Breeze comes with a SmartClimate Dual Cover System. It is an advanced zip-off cover with double the cool-to-touch power that cool and pleasant to the touch and that will also make you feel cooler when you lie down. The new Tempur Pedic Cloud Luxe Breeze soft model is quite soft when compared to other models. The PureCool+ Phase Change layer and TEMPUR-CM+ layer of this mattress place it around a 4-5 on a 10-point scale (10 being the firmest). So, when you lay on the mattress, you sink into it quite a bit, especially if you are a heavier sleeper like Andrew (230lbs). The Tempur Pedic differs from many other memory foam mattresses in that it may initially seem to sleep hot or be too hard. However, the company recommends a 2-3 week “break-in” period for your body to acclimate to the mattress, and as the time passes your body totally adapts to it. As it has been already mentioned, the new Tempur-Pedic Cloud Luxe Breeze soft is a very soft model and it gives you the feeling of sleeping on a could. It is extremely comfortable, it cushions your body and feels super luxurious. Although it doesn’t have any special technology and materials included in its construction, its high-quality, heavy foam for which it is known perfectly conforms and adapts to your body. Tempur Pedics used to be known for sleeping hot. The early models would be hot in the summer, and hard and cold in the winter. The ones we have used and slept on were no different. The company has introduced their special cooling technology to address this, which is a key feature in the Tempur Pedic Cloud Luxe Breeze model which to a degree isn’t bad, but really is just more layers of memory foam designed to wick heat away. These innovations are equally as effective as those of the mattresses including the newer heat regulating technology such as the use of copper, gel cooling layer or latex. Their new cooling technology does keep the mattress much cooler than previous generations of Tempur Pedic models for sure. Tempur Pedics are known for having a very minimal motion transfer, due to the use of a high-quality dense foam in their construction. However, sinkage with the new Cloud Luxe Breeze is a little pronounced because it is Tempur Pedic’s softest model, and when Andrew sat down on it, it compressed quite a bit but did not cause him to sink down to the foundation. Although there was a significant chemical smell with the earlier Tempur Pedics, they seemed to have addressed this with the current models, and with their delivery of uncompressed mattresses. So, no noticeable smell comes from the Cloud Luxe Breeze. Tempur Pedic used to sell their mattresses through major mattress retailers exclusively which helped them avoid dealing directly with the customers. Lately, however, they began selling their mattresses online as well. In-home delivery guaranteed by Tempur Pedic. Although Tempur Pedics are generally expensive (a queen Cloud Luxe Breeze costs $4499), the company offers discounts which can help you save up to 30% on certain sizes of the Cloud Luxe Breeze. 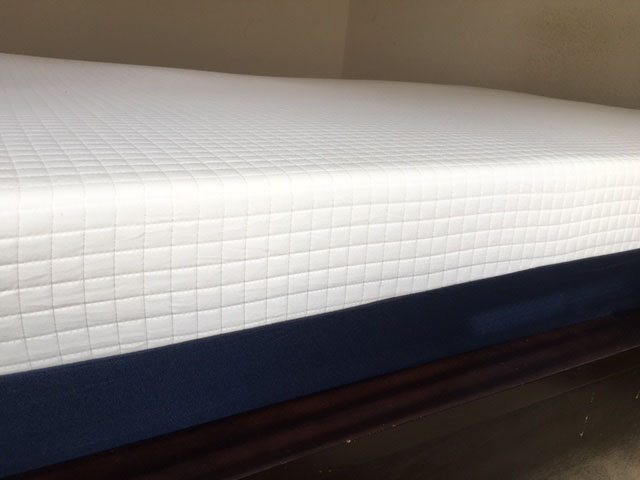 Click here to read the full Tempur-Pedic Cloud Luxe Breeze review. Click here to buy the Tempur-Pedic Cloud Luxe Breeze mattress at the best price. Below is our comprehensive side-by-side comparison of the Helix vs. Tempur Pedic mattress. The feel of the memory foam – If you like the soft feel of full memory foam mattresses, then the Tempur-Pedic Cloud Luxe Breeze may be the right choice for you. It is an all foam mattress, made of the high-quality dense foam layers that provide necessary comfort and hug typical for memory foam. Soft mattresses – Cloud Luxe Breeze a very soft all foam mattress. Its top comfort layers provide enough cushioning and they perfectly mold to your body. Sharing your bed – Memory foam is known for causing minimal or no motion transfer at all, and the Cloud Luxe Breeze does a good job at isolating excessive motion transfer as well due to its dense memory foam layers. Therefore, if you plan on sharing your bed with a partner, this mattress may be ideal for you. You can change your position or get in and out of bed during the night freely without disturbing your beloved one.